Elgato have certainly not stood still since I reviewed the Elgato DTT. 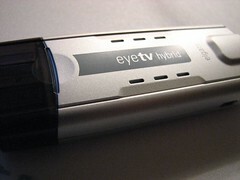 The latest innovation to come out of Elgato labs is the EyeTV Hybrid. 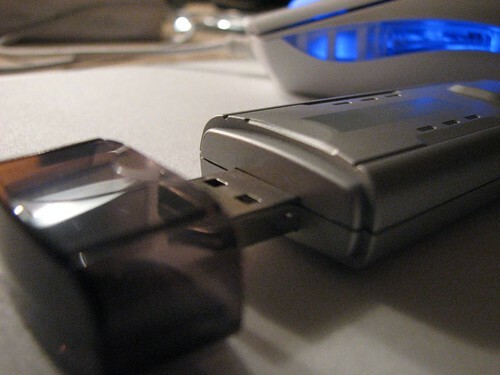 Addressing the main issue that I had with the DTT that I reviewed several months back, the Hybrid comes in a USB stick form factor and has a simple USB plug at one end and an aerial input at the other end. This is great news for those who would like a neater design in terms of portability. The DTT whilst relatively compact was a tad bit too big to carry around. I would certainly be more inclined to have the Hybrid with me in my bag or even my pocket this time around alongside the portable aerial. Enhancements do come plentiful in this model. The first most obvious design feature improvement is the form factor that I’ve already mentioned, the second being the tuner that has been squeezed in to this package. You can now get full access to analogue and digital transmissions over the air. Previously you would be restricted to one or the other. For me, this is perhaps the single most significant feature in the Hybrid since in the UK it’s not always possible to receive digital transmissions over the air, and in that situation I’d be stuck, however since their’s also an analogue tuner built in to the Hybrid I can now fall back to watching the basic 5 analogue broadcasts. With an analogue tuner built in, you can also use the Hybrid for your satellite set top box, camcorder or even games console! The support for 720p and 1080i is a bonus and ensures future compatibility with HDTV services. Please keep in mind that you will need a Dual G5 or Intel Core Duo Mac in order for HDTV to work. In the box you get the EyeTV 2 software, the Hybrid USB receiver, USB extension cable, break out cable for Composite, S-Video and Audio, Quick Start Guide and full manual on CD. The award-winning EyeTV software, hasn’t received as much recognition for its design, features and functionality as I would have liked. It’s certainly one of the Macs best kept secret. Now with built in Front Row support, you no longer need a separate remote control for controlling the EyeTV software. The interface itself can be activated and operated using the Apple Remote. Thinking about it, it just wouldn’t seem right if it didn’t have some form of Front Row integration or ability to control using the Apple Remote. The EyeTV Hybrid does have its flaws. It doesn’t ship with a remote like the DTT model did. As explained before, you can simply use the Apple Remote, but if your Mac doesn’t have the Apple Remote then you’re going to be stuck! 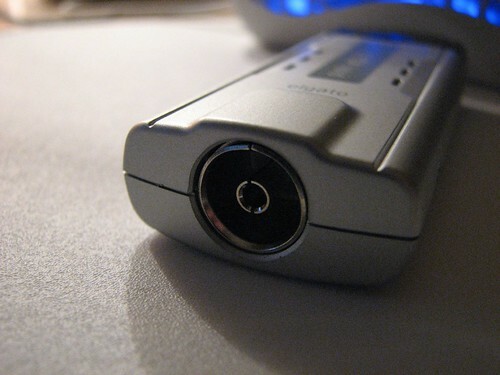 If you’re not familiar with the EyeTV software, then as a brief run down of its features, the technology behind the software is similar to what a Personal Video Recorder does on your TV. You have the ability to rewind, fast forward and pause live TV. And of course you can record manually or use the programming guide to schedule programming. A subscription to an online programming guide such as TVTV.co.uk will be required in order to have full programming guide functionality and scheduled recordings as well as the ability to set up remote recordings over the web. The subscription allows you to download programming for several days ahead and enables you to schedule recordings simply by clicking on the relevant programming in the TV guide. These programmes are then added to your scheduled recording list, titled and timer recorded. You can even select the ‘Convert to iPod format’ button so that once your recording is finished; EyeTV will then convert the file in to an iPod ready format H.264 or MPEG4 and export to iTunes! The remote recording facility is a smart feature that I haven’t seen implemented by anyone else. If you often leave your Mac connected to the net and you’re say at work and have forgotten to pre-set your EyeTV software to record a programme, all you have to do is log on to the TV guide service (e.g. tvtv.co.uk) choose the programmes you want to record and then this gets downloaded to your EyeTV schedule on your Mac so that you don’t miss any of your favourite shows! Whilst it’s not something you will probably need to use all the time, it only needs to be used once for it to have been useful. Kudos to Elgato for creating such a seamless experience with the hardware and the software, following the same design philosophy and paradigm that Apple take with their own products, the lines between form and functionality is yet again blurred by the hard work from the people at Elgato. 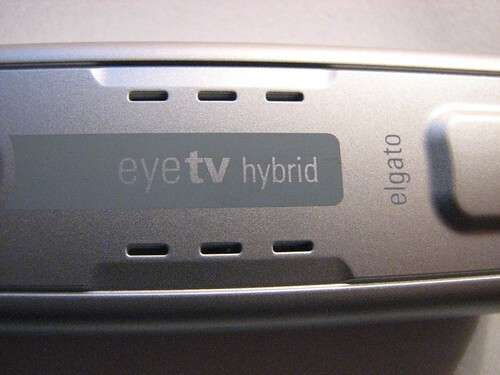 The Elgato EyeTV Hybrid gets the TechCast Recommended Award.